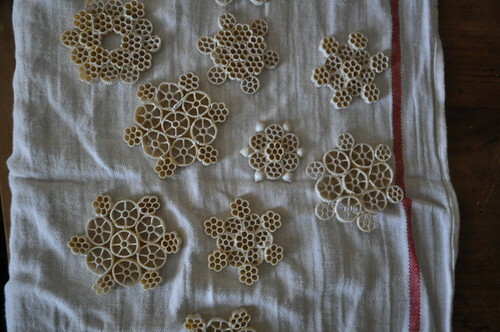 Over the weekend I worked on making some macaroni snowflakes. Crafty Stephanie from even*cleveland shared the diy last December on my blog. I didn’t use as much white paint on my snowflakes as Stephanie did. I kinda like the natural macaroni color showing through. The second photos shows me applying some glitter. Click here to find the full how to instructions. Don’t forget to use ditalini! They make a great addition. My daughter and tried this project. They turned out fantastic. We found it best to make components, like the center section and outer pieces. Let let it dry, then assemble it and add some extra pieces. Thanks for the inspiration! Found your blog through the Kitchn. I love this idea and plan to make some with my daughter this year. Thanks for sharing! I LOVE these and totally LOVE your blog!!!! So glad I found you (via the top 50 in the world list). Hmm I bought them last year. I can’t remember where. The brand is De Cecco. Maybe shubies? Definitely not crosbys. Box is blue and yellow. Where did you find the big wagon wheels? I live in Marblehead and between crosbys and S&S only can find the tiny wheels and flowers. Haha! Mega cute idea! And quite simple I imagine?! They came out great, Katy! Sooo cool! I had no idea that it was macaroni for a while! So glad I found this blog! It’s my new favorite daily read now. And you are located nearby (I am in Somerville). Thanks for sharing your (and Stephanie’s) creative ideas. oh my gosh, these are so awesome. Stephanie is a winter crafts GENIUS! Charming – so simple and homey! This is such a lovely idea! They look beautiful. I’m not actually getting a tree this year because my house is under renovations. They might just turn into gifts. saving this as plan for next christmas. yours turned out great! what a clever idea. are you going to hang them on your tree or string them as a garland? 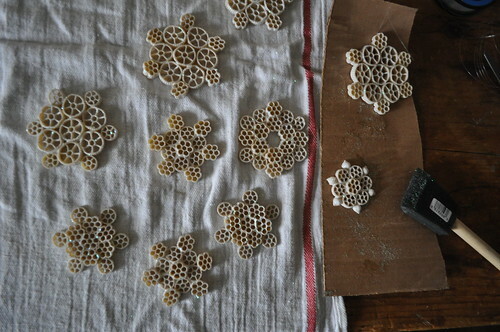 you know, if they wouldn’t wilt from the moisture, those would make beautiful coasters as well.